Abstract — In the wheelchair propulsion literature, it is common to report upper-limb (UL) joint kinetics to express shoulder, elbow, and wrist loads. Choosing the appropriate kinetic resolution coordinate system (CS) for UL joint forces and moments has become a laboratory-specific process. The differences that arise during interpretation may hinder a clear and broad understanding of UL joint kinetics during wheelchair propulsion. This article addresses the inconsistency of kinetic reporting in the wheelchair literature that examines the pain and injury experienced by manual wheelchair users. To highlight the variety of reporting methods in wheelchair propulsion, this article surveys peer-reviewed, published articles reporting wrist-, elbow-, or shoulder-joint intersegmental forces and moments calculated from inverse dynamics during wheelchair propulsion. To correct this inconsistency, researchers may need to standardize kinetic reporting methods to achieve a cohesive comprehension of wheelchair biomechanics. This article is provided to open discussion on the anatomical and clinical relevance of currently employed CSs and other available options, with the additional goal of providing an initial recommendation for kinetic representation during wheelchair propulsion. Key words: biomechanics, coordinate system, elbow, forces, joint kinetics, manual wheelchair propulsion, moments, rehabilitation, shoulder, upper limb, wrist. Abbreviations: CS = coordinate system, ISB = International Society of Biomechanics, JCS = joint CS, UL = upper limb. The quantification of mechanical loads has given us insight into the connection between wheelchair propulsion and the high incidence of upper-limb (UL) pathology in the manual wheelchair-user population [1-6]. Mercer et al. reported that manual wheelchair users who demonstrated larger shoulder-joint forces and moments during level wheelchair propulsion were more likely to exhibit signs of shoulder pathology on magnetic resonance imaging examination than those demonstrating smaller kinetics . Mercer et al. highlighted the value of joint kinetics as a metric in investigating mechanisms underlying the development of UL pain among manual wheelchair users . Before and subsequent to this article, many investigators have reported UL joint kinetics approximating the mechanical load experienced by the shoulder, elbow, and wrist during wheelchair activities [7-17]. A variety of methods have been adopted for reporting UL joint kinetics. Boninger et al. were the first in wheelchair propulsion literature to express the necessity of reporting joint kinetics in a local segment coordinate system (CS) when the goal is to relate biomechanical data to injury . Boninger et al. explained that the local CS should be anatomically relevant and, hence, linked to physiological-based motions and pathologies . While the trend has been to express joint kinetics in a local CS as opposed to a global reference, varied definitions and combinations of proximal and distal CSs have been used for the UL. One frequently used approach has been to express both the intersegmental joint forces and moments with the proximal CS [7,11,14,16-17]. A recent multisite study by Collinger et al. reported shoulder forces in the CS of the segment proximal to the joint and shoulder moments in the CS of the segment distal to the joint . Another option for kinetic representation, though not one regularly employed in the wheelchair literature, is the nonorthogonal joint CS (JCS), which uses a combination of axes from segments both proximal and distal to the joint . The International Society of Biomechanics (ISB) recommends using a nonorthogonal JCS for UL kinematics, but a similar recommendation for UL kinetics does not exist . Without a clear standard for use in UL kinetics, the variety of available options for data representation can confound clinical interpretation. Choosing the appropriate kinetic resolution CS has become a laboratory-specific process and may hinder a clear and broad understanding of UL joint kinetics during wheelchair propulsion. To correct this inconsistency, researchers need to standardize kinetic reporting methods to achieve cohesive comprehension of wheelchair biomechanics. We provide this article to open discussion on the anatomical and clinical relevance of currently employed CSs and other available options, with the additional goal of providing an initial recommendation for kinetic representation during wheelchair propulsion. Local segment CSs are commonly placed at either the proximal or distal end of a segment and are generally located at a joint center. After performing an inverse dynamics procedure to calculate intersegmental joint forces and moments, the investigators can represent the kinetics in any CS their marker set allows them to define. Joint forces are most often represented in either an orthogonal proximal or distal segment embedded CS (Table 1 and Figure). Joint moments can be reported in an orthogonal proximal or distal segment-based CS similar to joint forces, but joint moments can also be reported in a nonorthogonal JCS (Table 1 and Figure). The nonorthogonal JCS comprises (1) a fixed axis in the proximal segment, (2) a fixed axis in the distal segment, and (3) a floating axis. To highlight the various reporting methods in wheelchair propulsion, we surveyed peer-reviewed, published articles reporting wrist-, elbow-, or shoulder-joint intersegmental forces and moments calculated from inverse dynamics during wheelchair propulsion. We performed the literature search in PubMed, Medline, and Scopus using combinations of the following search terms: "kinetics," "wheelchair propulsion," "upper limb," "shoulder," "elbow," and "wrist." From the full collection of articles addressing UL kinetics during wheelchair propulsion, we chose a subset for presentation here. We chose the subset to characterize the full variety of data representation in the field without overlapping methods used by the same investigator. 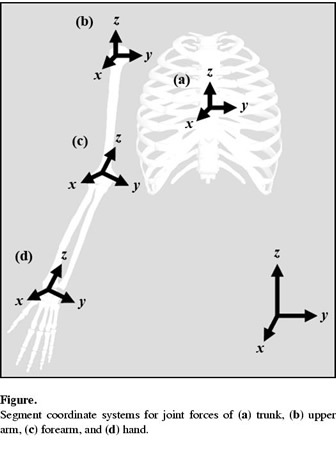 Resolution coordinate system (CS) definitions for upper-limb joint forces and moments. e1 = axis of first rotation, e2 = axis of second rotation, e3 = axis of third rotation. Joint kinetics during wheelchair propulsion have been reported for UL joints with various reporting techniques (Table 2). The majority of wrist, elbow, and shoulder forces were reported using the proximal CSs (forearm, humerus, and trunk, respectively). We found one exception: Boninger et al. expressed wrist forces in the distal plane using a hand CS with the origin at the wrist center . The elbow-joint forces were generally expressed in the humerus CS centered at the shoulder-joint center . The proximal CS origin for the shoulder joint was placed either at the acromion, shoulder-joint center, or trunk midline [7,12,14-15,19]. An older study performed by Kulig et al. expressed the shoulder forces in a global laboratory CS, but this practice has not been repeated in the literature . Wheelchair propulsion coordinate system (CS) representations of joint forces and moments. NA = data not present in referenced article. A wide spectrum of CSs has been used to report joint moments (Table 2). Sabick et al. reported moments at all joints using a combination of axes from the distal and proximal segments in which the transverse rotation moment of a joint was reported in the distal segment and the frontal and sagittal plane moments were reported in the proximal CS . Many of the articles have represented the moment in the CS proximal to the joint, although the locations of the CS origins varied between articles [7,14,16-17,19-20]. The remaining articles reported the moments in the CS distal to the joint [8,10,12]. The central concern over which CS to choose is in the value of the clinical interpretation. If the clinical interpretation focuses on injury prevention, then joint anatomy and joint pathologies should guide CS selection. Common to all the joint pathologies is their etymological proximity to the joint itself; therefore, any joint kinetics used to describe the load on a particular joint should be reported in a CS centered in the joint itself, whether it is proximal or distal to the joint. While the previous statement may seem like common sense, this article shows that many published joint forces and moments have been expressed in local CSs with their origin away from the focus joint. For example, shoulder-joint forces and moments have been reported in a trunk CS originating in the middle of the trunk and not near the shoulder joint [12,15-16]. An essential component to a clinically relevant reporting system is placing the CS origin near the joint center for both joint forces and moments. To address injury exploration and prevention in regards to wheelchair propulsion, we must consider the particular pathologies commonly afflicting this population and relate them to kinetic representation. The most commonly reported shoulder pathologies are impingement syndrome and joint instability. Posterior-lateral instability of the proximal ulna occurs at the elbow , and carpal tunnel syndrome commonly affects the wrist . At the shoulder, the superior migration of the humeral head potentially causes the impingement of the rotator cuff tendon and the anterior and posterior displacement of the humeral head is associated with joint instability. Considering these pathologies and forces, the ideal system for reporting the intersegmental joint force would be a proximal CS centered on the glenoid fossa. At the elbow, the intersegmental joint force with reference to a distal CS originating on the ulna would make sense to address the posterior-lateral instability of the proximal ulna. Without considering the pathology in the representation, the investigator may be unable to fully explore the clinical question. Moment representation is more complex than joint force representation because the chosen planes of motion should ideally represent the musculature functions within the body, while recognizing that physiologically, most muscles do not act entirely in one plane of motion. Schache and Baker investigated lower-limb joint moments and their clinical interpretation when differing reporting methods are used . In choosing the most appropriate reference frame, Schache and Baker explained that the choice should be based on which CS is "most useful in understanding the biomechanics of gait with or without pathology" . This statement is of global importance in biomechanics and can be applied equally to the UL. Their final recommendation was that a nonorthogonal JCS provides an implicit link to muscle activity and offers a clinically useful representation of what a joint moment actually represents . For the same reasons, we can argue that the nonorthogonal JCS is appropriate for UL joints as well. To elucidate this point, we consider the elbow joint. With the elbow flexed to 90°, the abduction-adduction moment based on the proximal CS would be the same as the supination-pronation moment based on the distal CS. This problem only grows when we consider the shoulder. Changes in what is considered an abduction-adduction moment versus a flexion-extension moment alter dramatically as soon as the humerus segment undergoes any axial rotation. Wu et al. experienced the same problem when trying to clearly represent shoulder kinematics with a classic Cardan sequence; hence, the ISB recommends using the JCS with an Eulerian sequence . The JCS provides the functional and anatomical relevance for moment representations that is incompatible with orthogonal axes . We address the inconsistency of kinetic reporting in the wheelchair literature that attempts to address the clinical problems experienced by manual wheelchair users. This discussion is not relevant in purely academic practices but is put forth for clinically directed motivations. In the future, researchers should appropriately select a CS that can address the clinically driven questions for which they seek answers. Whether attached proximal or distal to a joint, CSs for force and moment representation should be centered within the joint of interest. The JCS offers a less ambiguous and more anatomically relevant representation of joint moments and a clear demonstration of muscle activity. Future implementation of clinically significant standard practices will advance the field toward a full understanding of the link between wheelchair propulsion and pathology. Study concept and design: M. M. B. Morrow, W. J. Hurd, K. R. Kaufman, K. An. Drafting of manuscript: M. M. B. Morrow. Critical revision of manuscript for important intellectual content: M. M. B. Morrow, W. J. Hurd, K. R. Kaufman, K. An. Obtained funding: K. An, K. R. Kaufman. Study supervision: K. An, K. R. Kaufman. Funding/Support: This material was based on work supported by the National Institutes of Health (grant R01HD4878). Additional Contributions: We acknowledge Kathie Bernhardt and Diana Hansen for their assistance with subject testing and data processing. Melissa M. B. Morrow has earned her doctorate since the time of manuscript acceptance. 21. Lin VW, Cardenas DD, Cutter NC, Frost FS, Hammond MC, Lindblom LB, Perhash I, Waters R, Woolsey RM, editors. Spinal cord medicine: Principles and practice. New York (NY): Demos; 2003. Submitted for publication December 23, 2008. Accepted in revised form May 27, 2009.